Free Pickup & Return From Apartment/Villa.. Entrance fees to the Volcano (US$12.00 per person), Botanical Gardens (US$5.00 per person), Tet Paul Nature Trail (US$10.00 per person) and Lunch Cost (US$10.00 and up per person). During this tour, you will enjoy a ride in a private air condition vehicle that will take you throughout Soufriere. Along the way, your guide will tell you lots of great stories about St. Lucia, including the history of the island. ​Other tour highlights include the Botanical Gardens, a dip in the hot mud baths and Sulphur Springs, Tet Paul Nature Trail and the chance to enjoy locally prepared meals as well as local rum. If that isn’t a great way to relax and enjoy your day, we don’t know what is! ​You will definitely want to bring a camera on this trip, as it is simply packed with photo opportunities. From the local fishing villages to Soufriere, picturesque scenery abounds. The Piton Mountains are certainly one of the trip’s highlights, and the views from Soufriere are unbeatable. ​We will head over to Diamond Falls, where you can enjoy both a picturesque waterfall and a lush, gorgeous botanical garden. The therapeutic hot mineral baths here were commissioned by Louis IVX and are renowned across the island. From here, we will visit the only drive-in volcano known to exist. Here, we will take a dip in the natural sulphur mud pools, which are renowned for their healing and age-defying properties. ​After a relaxing dip and a shower to rinse off, we will get back into the vehicle to take you back to your rental villa. ​Guests of Islander Villa rental properties get more than just the best accommodations on the island at the best prices. Our guests also get access to the best tour of Soufriere available anywhere. ​This half-day tour takes you to all of the island’s most scenic and interesting landmarks, from the historic town of Soufriere itself to charming fishing villages and more. 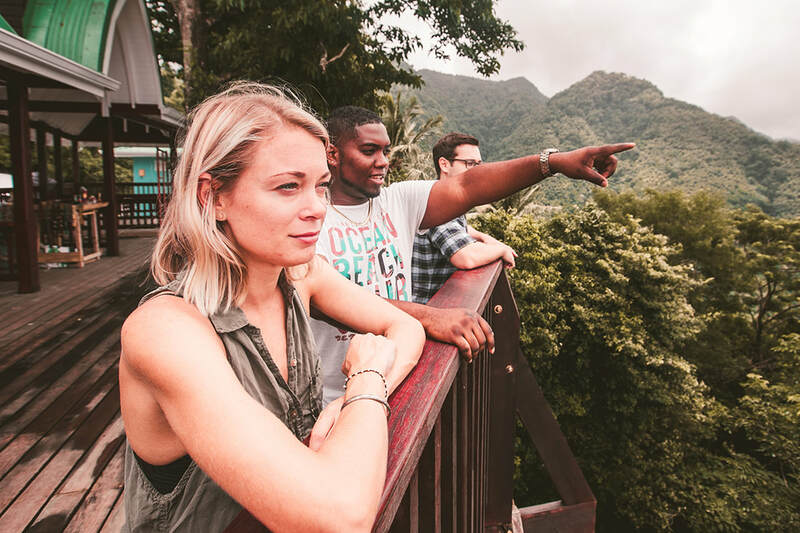 A local guide is there to make your tour both interesting and fun, and you will enjoy such sights as the Piton Mountains, the Diamond Falls Botanical Garden, and the incredible mud baths found at Sulphur Springs. Your tour also includes local food and drinks as well as transportation from your rental villa.